When I was a child growing up in the North End, the streets were my playground. We didn’t have specially designed play spaces with eco-friendly, non-toxic equipment made from recycled materials. The turf we played on was concrete and asphalt and brick. If we wanted to see some grass, we went to Sly Park. Or sometimes we went over to Copp’s Hill Burying Ground. I remember one time I broke out with a mysterious rash on my face. A trip to the doctor’s office confirmed that I had contracted poison oak. “Where would my daughter be exposed to oak trees around here?” my mother asked. The doctor wisely answered, “Do you know where your daughter is at all times?” Of course she didn’t. We were roller skating all over the streets of the North End. With our skate keys hanging from our necks we flew up and down Hanover Street, Battery Street, Charter Street and all the other streets in our neighborhood. But Holden Court was our own private playground. It’s a courtyard situated between 402 and 404 Commercial Street where I lived. In that safe space my friends and I played hopscotch, jumped rope, threw balls against the brick buildings and played Red Rover. We traded marbles that we called aggies or squirted each other with our plastic water guns. My best friend, Irene Giuliano, would walk over from her apartment around the corner and standing below my second floor window, she would call up to me to come down and play. We would be joined by my sister, Angela, and our other friends, Elena, Juanita, Dolly, and Joey who lived on Holden Court. If it were raining, we sat on the front steps inside my building and played board games like Sorry, Go to the Head of the Class, and Easy Money. Using a well-worn deck of cards, we would play War for hours. We had fun until my Aunt Mary, returning home from work, chased us back outside. After supper in the summertime we would venture across the train tracks on Commercial Street and play on the loading docks of Battery Wharf or climb into the empty freight trains that were parked for the night. We were imaginative and energetic in our play. 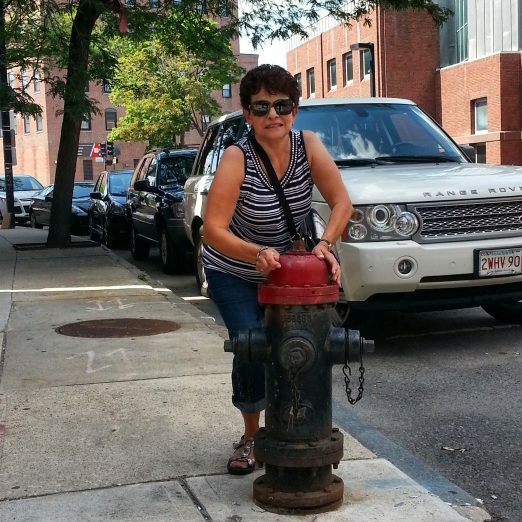 The fire hydrant situated on the sidewalk at the entrance to Holden Court is a symbol of our childhood enthusiasm. We made a game of jumping over that hydrant again and again. On a recent visit back to Boston my brother thought it would be fun to snap a picture of me attempting to jump over the hydrant. Alas, it wasn’t so easy anymore. But back then, in my childhood, it was easy and oh so much fun. NorthEndWaterfront.com welcomes commentaries on community issues via email to info@northendwaterfront.com or through our Submit a Post online form. 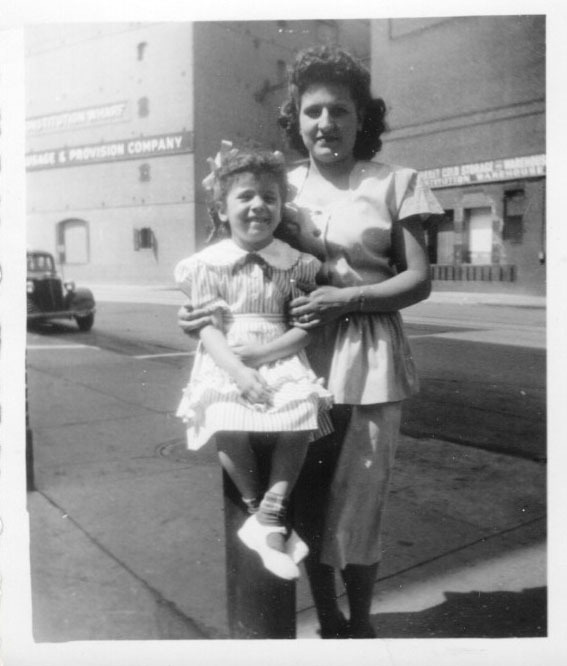 Hi Angela do you know my dad Charles Maniscalco he was from the North End (Charter and Prince Street) family of 8 ? Thank you Natalie, who I used to call Natalie Ann. I’m the “Joey”you mentioned in your writing and the memories you brought back just made my day. Those days are part of my upbringing and sometimes it’s hard to explain to non North Enders how much fun we had. In the warm weather I couldn’t wait to get outside after supper to meet all the kids but I had to wash the supper dishes first. One brother had to clear the table and the other had to throw out the trash. On hot summer days I remember sitting on the ground and playing with gimp. We used to call Holden Court the yard and I still remember everyone mentioned and more. The younger ones played with my brother Libby, Butchy, GloryAnn and Carol. Your sister Angela and I would sit on the stairs of your building and name all the cars that would pass by. The older kids were Marie and JoAnne. The building landlords were the old Italian women, my grandmother Teresina, Angelina, Fonsino and your grandmother Angelina. They would always yell at us for throwing balls against the brick. My younger brother who wasn’t even born at this time is now the owner of our old building. He doesn’t have these memories but I remember them all and thanks for posting and reminding me of my beautiful childhood that I never forget. Oh ok, Charlie the father of the kids my grandfather on his side passed away of a heart attack, and really my dad was a quiet kid lol ? Valentina the mother of the kids passed away in 2009 in Winthrop. You must know Gus, Joanne, Marylin, Tina, Jimmy, Annette, and Sal. What a great story! I smiled while reading to the end! We were all so fortunate to be raised in the North End. Thanks for sharing your story! So happy to hear that my memories are also shared by so many others. Glad to hear from you, Joey and Corinne. We truly had a blissful, innocent childhood. Does anyone remember playing marbles on those flat Edison metal plates on Charter St.? Also does anyone remember the shed in the Slye Park where lovers would go at night?